Panasonic launches a new digital pressure sensor which focuses on very simple operation. This pressure sensor has been developed especially for the electrical and electronic, semiconductor and auto-assembly industry, and the biomedical industry (laboratory automation), where simplicity and performance are key objectives. 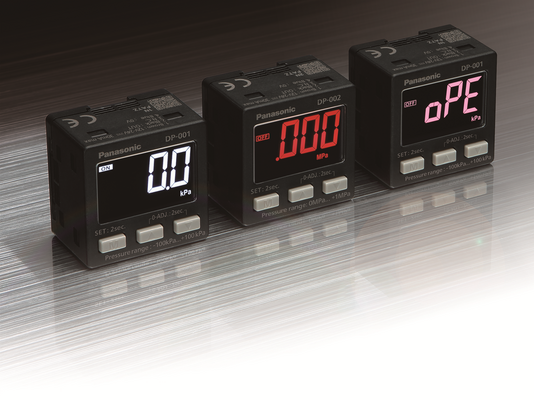 Compared with the DP-100 series, which features a multitude of functions, the DP-0 series has been designed to make configuration fast and simple. To assure easy access to the essential functions, two levels of setting modes are available: The RUN mode is used for setting threshold values, zero point adjustment and locking or releasing the keys. The detailed setting mode is used for basic settings regarding the sensor operation. The LCD display offers a wide viewing angle so the display is easy to see even from an oblique angle. Also the color can be selected from red or white in accordance with the output operation. The unit body measures only 24.9mm in depth and allows installation in a narrow space. The very light weight of only about 25g allows mounting on a robot arm, for example.